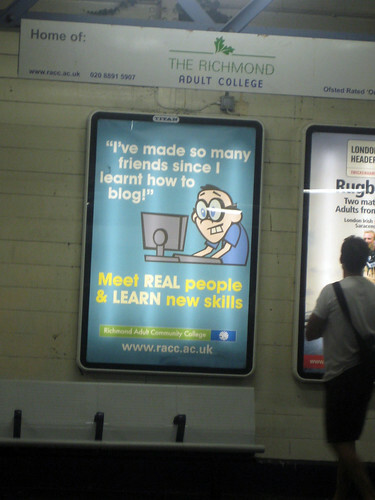 "I've made so many friends since I learnt how to blog", says the nerdy, buck-toothed, geeky, specky guy hunched over his computer. As I was on the way to a friend's birthday that I met through blogging when I spotted this ad on Saturday night, it obviously caught my attention. d) Richmond College is the answer to your networking and educational needs. I have nothing personally against Richmond College. I "learnt" basic Dreamweaver there and as a result got free internet access in their "Business Library" for a year, which was handy when I needed to use the net when I was out and about in Richmond. The standard of teaching was passable to OK. I also did a much better two day Photoshop course there, with an entertaining and funny teacher (who also teaches digital photography) which fortunately restored my faith in adult education centres. However, as a blogger I think the guys and girls at Richmond College should have hired a copywriter or artist who actually knew something about blogging and how to draw cartoons. But, as my council tax is somehow supporting the college, perhaps I should just be glad they didn't have the budget to spend on a better writer or cartoonist. I certainly met REAL people at Richmond College, but haven't kept in touch with any of them, unlike a lot of my blogging friends, who I've not only met in real life but a number have been really supportive to me and sometimes been much more help than my "real" or rather "meat-space" friends. The thing I really hate about the ad is that it makes you think of the internet as some weird place populated by nerds with no social skills who aren't "REAL". It's as though the friends you might "meet" through blogging are robots without feelings, who certainly aren't going to teach you anything. Or at least you won't LEARN any new skills through mixing with them. Maybe I've just been lucky, but the vast majority of the people I've met through blogging have been funny, bright, witty & very clever folk. I don't necessarily have friends to LEARN new skills through them, if I do it's a bonus. It's ironic that blogging meant that I was out having a laugh on Saturday night, rather than sitting hunched over my computer with my specs on. Thanks Darika for a fun time. It was lovely to meet your mates & see Shiny Media's Gemma again. Good to also meet in the flesh fellow Twitter tweeter Gary Andrews. Darika's mates also knew a number of my other blogging & PR'ry friends and one worked at PC something or other with a journo who'd been on the Dell Orient Express trip with me. Anyway enough from me on the ad. Perhaps it just rubbed me up the wrong way and I'm being super sensitive. I'm only going to have to look at it for another month or so if I travel into town on British Snail. 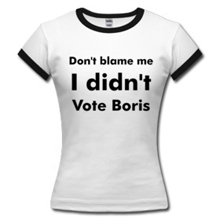 It would be great to have your views on it. Ah, but then you're not REAL people so probably don't have any opinions.